It was, so he drove on blindly. The water flooded the engine and plugs but the impetus carried the car across and up an incline at the far side. He dried the plugs and tried the starter. The car got going and they were in time for the meeting. The girl was Edel Quinn and the incident typical of her story. 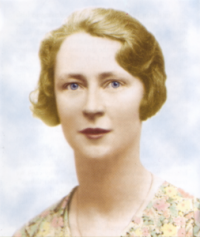 In 1936 she had been sent from Dublin to establish the Legion in East and Central Africa. The difficulties were enormous but she met every challenge with unwavering faith and courage. When others faltered her invariable response was, "Why can't we trust Our Lady?" or "Our Lady will see after things". For nearly eight years, her health steadily declining, she worked over the vast territories committed to her. Hundreds of Legion praesidia and many higher councils were set up on an enduring basis. As a result, thousands of Africans are engaged in the Church's work of evangelization. On December 15, 1994 Pope John Paul II declared Edel Quinn "Venerable". One miracle attributed to her intercession is still required for her Beatification.